BTK Dyno Day 2.0 9/10/16!!! 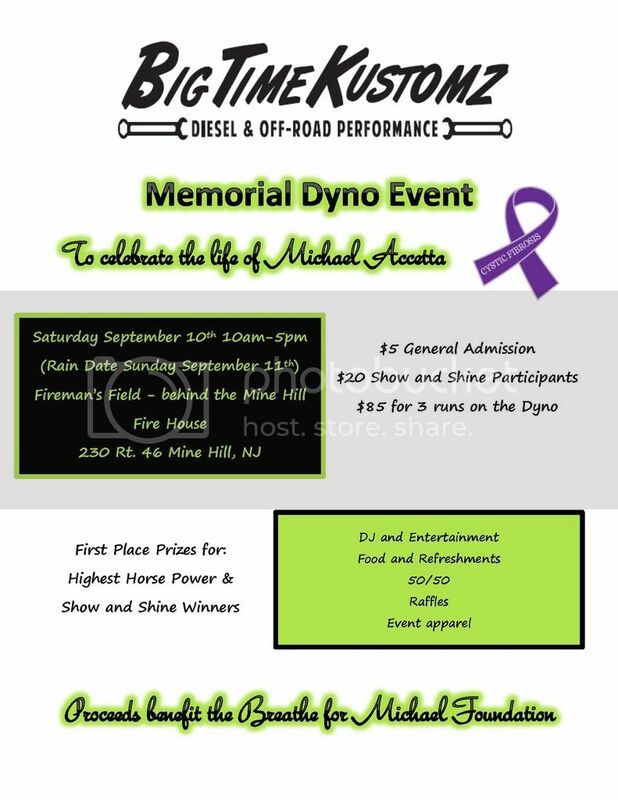 Big Time Kustomz is Proud to announce that we will be hosting a Memorial Dyno event this fall for our friend Michael Accetta. We'll keep this updated as details start to unfold. Please spread the word, lets honor, remember, and celebrate our friend Mike in the best way we can! Last edited by Tom@BigTimeKustomz; 07-06-2016 at 07:19 PM. gonna try to make this man! Event is starting to take shape, very proud to say a lot of great sponsors on this site have stepped up to help us make this a great event for Mikes Family. Most of you may not have known Michael but he was a great friend of Big Time Kustomz for many years. Unfortunatly he lost his battle in June to Cystic Fibrosis so we are putting this event on entirely for him and his family. Anyone who knew mike new that his trucks and his family were his entire life, so we are hoping to make this a great event to remember both. we are hoping to raise a good amount of money and be able to donate it back to the family. and here is a copy of the flyer. Thank you to all who are helping us out with this! Gonna try to make this and do the show&shine. Annnddddd dyno spots are all full! We will have a backup list coming out soon. Thanks to all who signed up! This event is 1 month from today. Thanks to all sponsors of this terrific event! It's going to be awesome. Hope to meet guys from here that day! This incredible event is just a few weeks away. Don't miss it! Going to be awesome. unfortunately wont be able to make it. one of my friends decided to get married and be all happy on the same day. Only a week and a half away from this awesome event! Hope to see some of you guys there!!! 5 Days away and the weather looks to be absolutely perfect. Guys who don't wish to dyno can enter our show/shine contest. Bump 2 days away! Thanks to all the sponsors for helping out and making this event happen!! Thanks to all who came out today! Was a great day honoring the life of Michael Accetta. Great to meet some awesome people and see some awesome horsepower trucks! Sent from the BTK Lair! Last edited by Tom@BigTimeKustomz; 09-10-2016 at 05:54 PM.